Silence descended upon the courtroom. The judge rubbed her knuckles and sighed. Her arthritis was worse today. She’d been taking the steroids and pain meds that the doctor prescribed, but they hadn’t helped one bit. She often wondered if her doctor was really a qualified physician. Doc. That was his name. Just Doc. No last name. Like Sting. Or Madonna. He was also a dwarf. The judge stood up, retired to her quarters, and shut the door behind her. A thick folder lay on her desk. She sat on her leather chair and read the title of the next case: Wendy vs Peter Pan. Wendy was accusing Mr. Pan of breaking into her bedroom (although technically, he flew in). The judge groaned and opened the top drawer. She retrieved a plastic bottle, opened the lid, and swallowed two aspirins. This was going to be a very long day. Aurelio Rico Lopez III is a self-diagnosed scribble junkie from Iloilo City, Philippines. His tales have appeared in various anthologies such as RAW MEAT (Sideshow Press), BOOK OF SHADOWS VOL. I (Brimstone Press), TRIP THE LIGHT HORRIFIC (RAGE machine Press), THE BLACKEST DEATH I, II, & III (Black Death Books), COLD FLESH (Hellbound Books), SHADOW BOX (Brimstone Press), and STAR-SPANGLED ZOMBIE (Maniac Press). 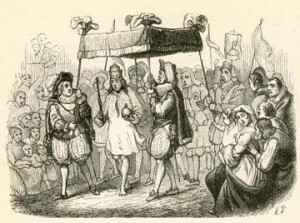 Image: The Emperor’s Different Clothes, Vilhelm Pedersen, <eventyr, Denmark 1848.